I'm setting up my streaming systems (will blog a lot about that later) and one thing that I ran into was not having enough power on my cheap USB hub that I use near my seat. I wanted to connect an old iPad to it so I can use it as an external monitor but I also need to have a mouse and maybe some other things in it too. And since it's just a cheap USB 2.0 and iPad is a power hungry device it just won't do. Fortunately the hub I have was designed to have an external power supply. 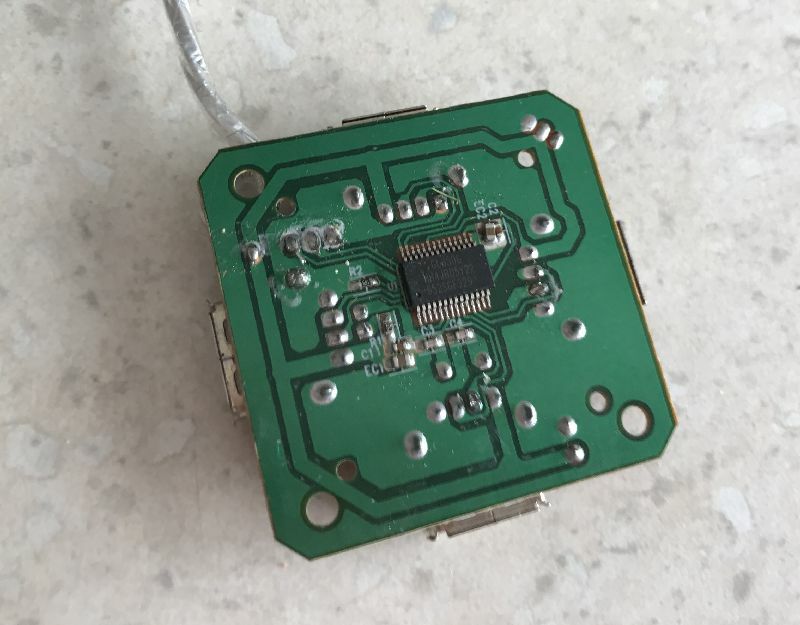 It has the connector spot and even a hole in the casing for this. I'm sure they thought why not do this and provide two versions if needed, since it doesn't really add any costs. So I opened the hub and checked it out. 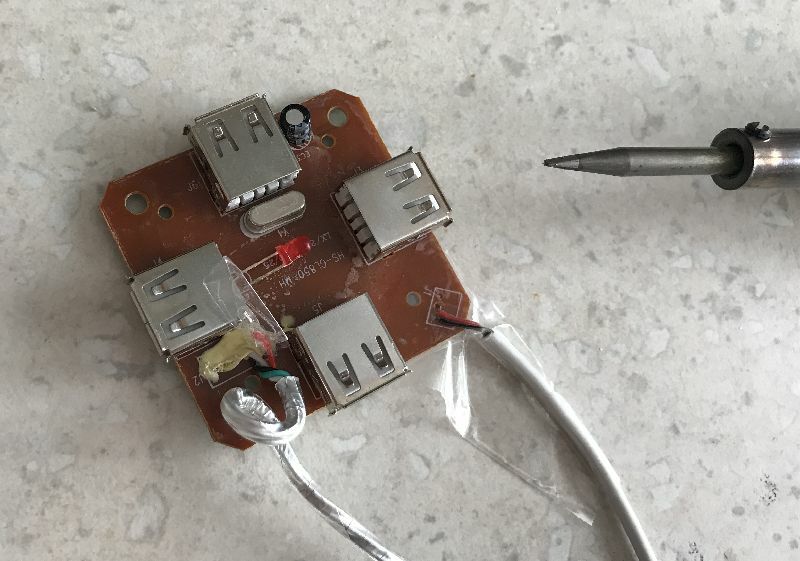 First I desoldered the power wire from the PC cable. This is very important because you don't want to connect an external power supply into your PCs USB port. 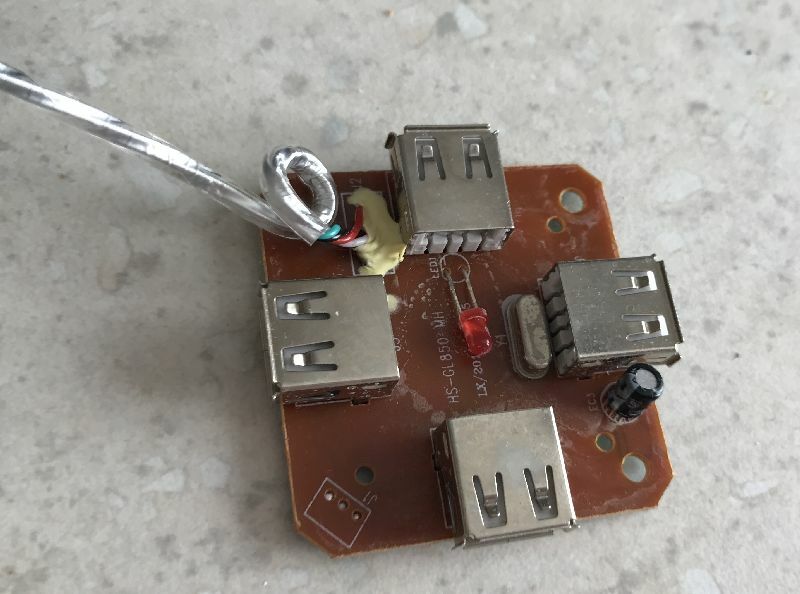 The voltage and current may jump around, especially with cheaper power supplies, so this is an easy way to break your USB ports. Of course I also taped the wire nicely to prevent contact with anything in the hub. I didn't want to cut the wire since I might someday need to put this back into a non-powered state. Of course if you like you can just add a switch to change from PC-powered to external-powered and then you can use the hub in either mode. I most likely don't need a non-powered hub since I have those already, so this is a "permanent" mod. Then I took an old crappy USB-Lightning cable which was so cheaply made that the Lightning end just basically fell off. Since I'm a frugal person I didn't throw the cable away and now I have use for it. So I chopped off the data wires (white and green) since those aren't used at all. Then I soldered the black and red power wires to the place where the power connector is supposed to be. It's easy to check from the underside of the board where anything goes. 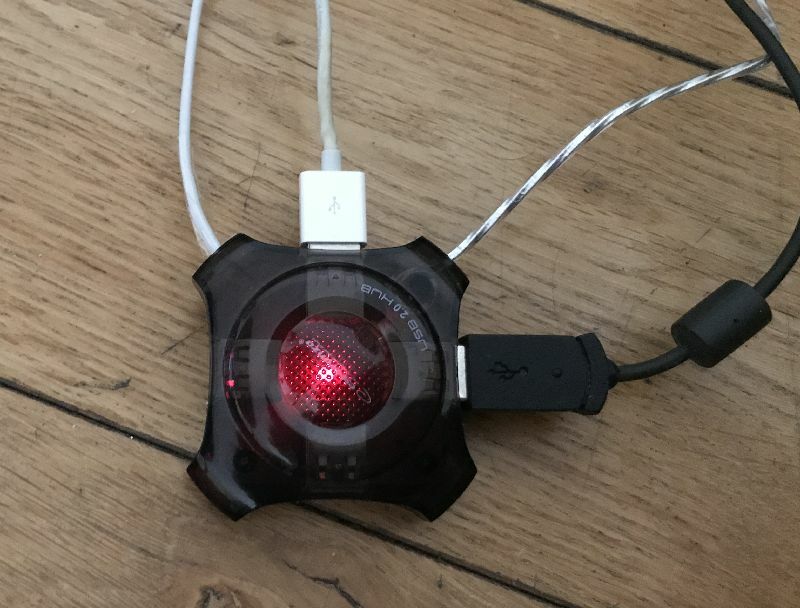 The ones on the sides were connected together and into the big ground area and the middle one connected to the PC's USB cable's red wire. So simple. Then add some tape to hold things together (I really should put something to hold the power cable better, someday...) and screw the case back on. Connect a power supply, connect to PC and voilá! No more USB devices dropping off since the hub now provides power from an external source! iPad external display initiate! No more bulky old 17" VGA monitor with its cables! pgAdmin 4 - Why oh Why?